Flossing. Some people love it and some people hate it. However you feel about it, dentists always recommend flossing in order to maintain a good oral hygiene practice. Brushing, as important as it is, doesn’t always remove food that’s trapped between the teeth and can lead to gum disease and tooth decay. Flossing, on the other hand, does. Of course, there are downsides to flossing, but the good far outweighs the bad. Here is our list of the 8 best flossing tools for 2019. The top-rated Waterpik flosser has been a long-standing favorite. This nifty tool is a perfect way to clean in between the teeth without having to fiddle with flossing string. A Waterpik flosser uses water for a powered flow to dislodge debris. Water flossers have the ability to remove up to 99.9% of plaque.And since standard brushing only targets about 60% of the tooths surface, it still leaves around 40% uncleaned. Those with braces will really benefit from a Waterpik as brushing is more difficult and standard flossing feels impossible. The great thing about a Waterpik is that it not only does its job brilliantly, but it also requires very little management. A brief rinse weekly and a more thorough clean once every couple months is perfectly sufficient. In fact, you can clean a Waterpik in less than five minutes. These are a step up from standard flossing string. A very simple contraction, yet extremely easy to use. One thing that puts people off from using regular floss is how tricky it can be to navigate it, especially when it comes to the teeth towards the back of the mouth. Eliminating this issue entirely is the flossing picks. The stretched flossing string is attached to a handle that you can hold. Traditional flossing without the hassle. Flossing picks are also great for traveling. Relatively new to the market the Air Floss was designed in a similar way to the Waterpik. Rather than use only water, it adopts a technology called “microburst technology” which shoots a combination of air bursts and water droplets. Using this flossing tool will remove food debris, harmful bacteria, and plaque from the teeth. It is also very quick to use. Within approximately a minute, this tool can reach all areas of the mouth, meaning that the teeth are clean and flossed in just sixty seconds. The floss threader was specifically created to make flossing possible for those with braces. Another very simple design that makes the world of difference when it comes to oral hygiene for those with braces. The small tool is in the shape of a needle and typically made from plastic. 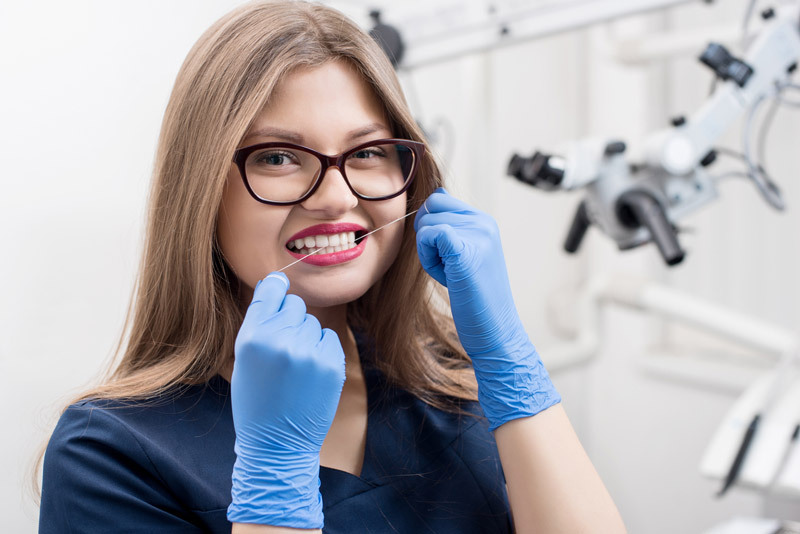 The eye is big enough to easily thread the flossing string, and by feeding it underneath the wires, the floss can be used as normal to clean between the teeth. This form of flossing is also a braces-friendly method. The interdental brushes are very tiny brushes that are extremely flexible. They bend and twist to get in all sorts of positions helping to clean those hard to reach places thoroughly. The bristles work the same as a toothbrush but just in between the teeth. Interdental brushes are available in many different sizes ideal for all teeth. If you like using dental picks, then you might consider purchasing a floss holder. This tool is more like a reusable dental pick where you attach the floss yourself. The long handle makes it much easier to floss your teeth as well as being a lot quicker. In the long run, a floss holder will work out a lot more cost effective as opposed to dental picks. If anything, you can at least cut down on plastic use since the tool can last forever. While it is not a flosser itself, a dental mirror will make the flossing of teeth much more comfortable. The lower teeth are easy enough to see. However, the upper teeth are not. 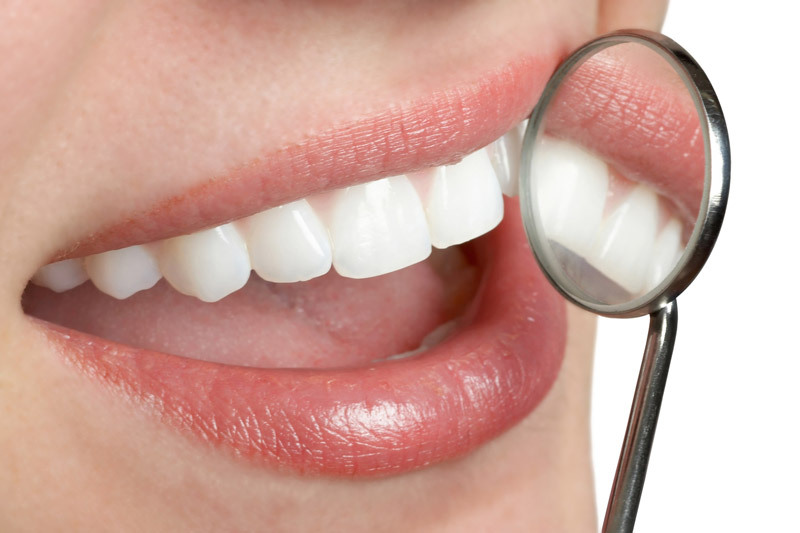 Without the use of a dental mirror, you will have no idea of the condition behind the teeth. Having a dental mirror on hand will help you to get every possible space giving you a thorough clean. Some dental mirrors on the market come in a pack with other tools such as a scraper and a stainless steel pick. If it is within your price range, then there’s no harm in having these additional tools on standby for particular stubborn debris or plaque. Just make sure you use them with caution. Technically a portable oral irrigator is the same as a Waterpik device just more compact. Due to it having the portability, we thought it was still worth mentioning on the list as it is still considered one of the best flossing tools available. The portable water flossers will need to be charged in advance very much like electric toothbrushes. They still have a selection of settings from a gentle low massage to a jet mode. Typically, the portable oral irrigators come with a variety of heads so that you can test out different ones and find the one you prefer. The compact model is just as effective in cleaning between the teeth and the gums and takes up less room than the traditional Waterpik. 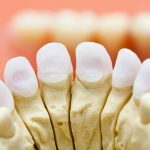 It is much kinder on the gums than dental floss is as there is a much lower chance of accidentally damaging the gum tissue. Flossing is essential for a number of reasons. It reduces plaque, harmful bacteria, and food debris. Understandably, there are many irritating factors with flossing and using one or more of the above tools could make the process much easier. With a regular routine of flossing, oral health is significantly improved, the chance of cavities and tooth decay are reduced. Those with braces often dismiss floss as they sometimes assume it isn’t possible. 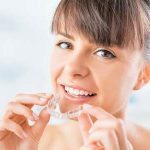 While it isn’t impossible to floss with braces, it certainly isn’t easy; however, the specialized flossing tools for braces will make it much easier.